Crete really took me by surprise. I’m ashamed to admit that if not for the boyfriend’s suggestion, I probably wouldn’t have put it on my list to visit. Thankfully, he was there to steer me in the right (and delicious – Cretan cuisine is second-to-none that I’ve tried anywhere else in Greece) direction. I am so glad that I visited Crete and hope that should you ever visit the Greek islands you heed my advice and not leave Crete off your travel itinerary. First of all – it is a big island. If you want to explore it fully (particularly if you’re keen to hike around), you could easily spend a week or two or three there. Outside of the walks to be found in gorges and mountains, there are a slew of beaches to discover. Unfortunately, we spent only three nights there, in Central and Western Crete, but I left feeling I had a good taste for it, and a definite interest to return for more some day. Ruins with a view. And symphony of cicadas. The one thing I didn’t care for in Crete was its capital, Heraklion. It’s not completely awful (in fact it was a nice change of pace from Dubai, in any case), but in comparison to pretty much anywhere else I’ve been in Greece, nothing about the town itself really makes it stand out. However, due to its port which will connect you with ferries to the Cyclades and its close proximity to the ancient site of Knossos, it is unlikely you’ll avoid it entirely. Spend a night there, get out of it what you can, then move on to another part of Crete or another island entirely. We were there as our flight arrived in Heraklion (although there are other airports in Crete, including Chania), and so it served as base for arrival and a jumping-off point to visit Knossos and then move on to Western Crete. So, after an afternoon and evening wandering around Heraklion, we rented a car and got the hell out of Dodge first thing the next morning to try to beat the crowds to the Palace of Knossos. We didn’t beat them. And this would be a running theme through our entire trip around the islands. Crowds were a fact (ugh, and the cruise ship crowds were the worst); you can’t beat them, nor do you want to join them, so you simply must learn to live around and avoid them best you can. We had chosen to visit not just during high season, but peak season (“peak” is generally the last week of July through the first to second week of August), so it was simply the price we paid to spend two weeks escaping from the oppressive Dubai summer and Holy Month of Ramadan. It was worth it. 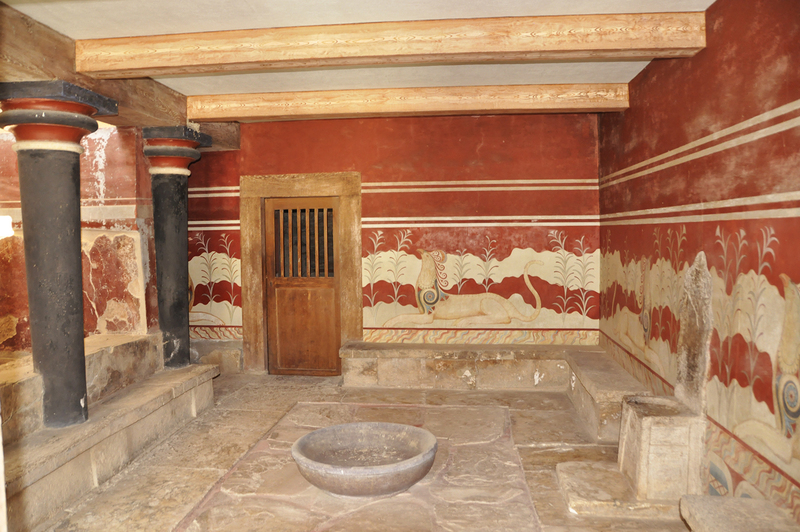 But back to Knossos. 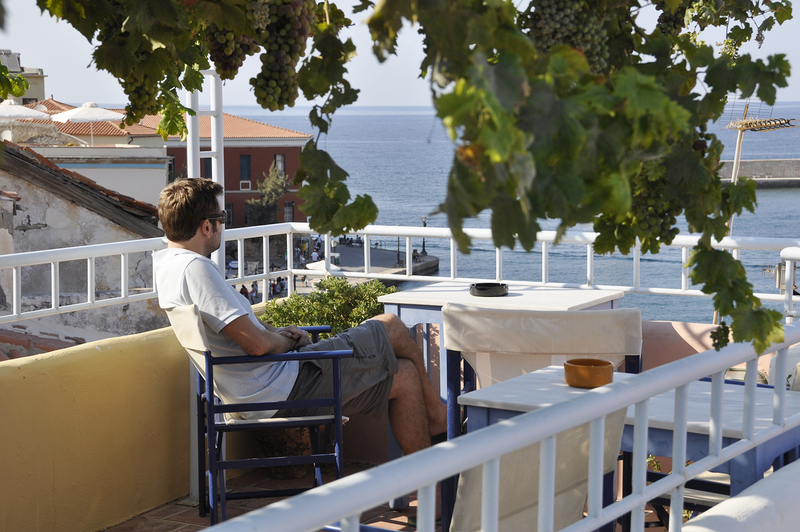 If you’re in Crete, it’s one of those key things that you really can’t pass up. 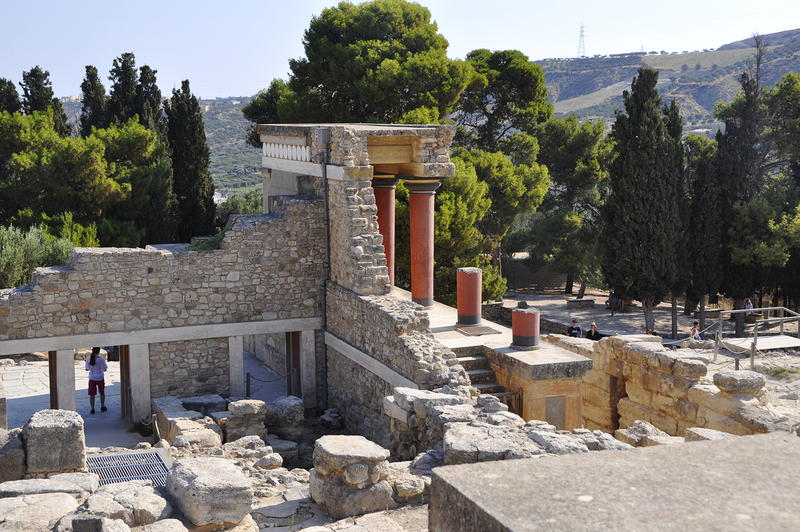 Despite the criticisms on Arthur Evan’s excavation and interpretation/restoration methods, Knossos’ place in Grecian mythology and history is such that a visit to the archaeological site is impossible to be anything less than interesting. You’ve got the mythology of King Minos, Ariadne, Theseus, and the Minotaur (along with his Labyrinth), and the complex’s long history dating back to construction starting in 1700 BC and moving on to become the center of Minoan culture. As you walk through it, checking out frescoes and peeking down stairwells of what was a large and multi-storied structure and avoiding bus groups and seeing storage rooms full of pithoi, it’s nice to think about what it would have been like to inhabit this place. The grounds are extensive (1,300 or more rooms, I believe) and the views of the surrounding area are particularly beautiful. The palace even had plumbing, and a flushing toilet in the queen’s chamber (astounding in any case, but especially when you consider that thousands of years later in today’s modern world, you’ll find places that have yet to sort that out). After Knossos, we headed west to our base for the next couple nights, Chania, a couple hours drive away from Heraklion. Midway between the two however, was Rethymnon, another old Venetian harbour town where I had considered staying instead of Chania. Not wanting to ignore Rethymnon entirely, it was perfectly situated for our lunch stop that day. After trying to find a place to park for ages (this is a thing in Crete’s old towns – they are mostly pedestrianized in the old town and harbour areas, but the maps don’t show that and so you drive around thinking you can take all of these roads to where you want to go but you can’t) we finally made it in and after walking through the town’s old Venetian fort and streets lined with shops and cafes, I found Rethymnon to be much nicer than I was expecting. I started to fear that I had made the wrong choice in choosing Chania over Rethymnon for our Western Crete base. Avli restaurant in Rethymnon & my favorite meal of the entire trip. Taking a tip from Lonely Planet, we stopped for lunch at a place called Avli, which was said to serve fresh farm-to-table Cretan cuisine. While we had many great meals while traveling through the islands, the food we had at Avli was hands-down the best. Everything was extraordinarily flavorful and interesting, while not being being so creative as to overpower the fact that it was Cretan above all else. In a bid to not eat too heavily (and already realizing that portions served all over would be large), we decided to share a couple starters and one entree only. I regret this decision, as the food was so amazing, I am a bit bummed out that we missed out on trying another dish if we would have ordered an entree each, like usual. The meal began with fantastic fresh bread served with a side of creamy potato salad. I’m a big fan of potato salad (or anything potato, really) and I think I’d go ahead and say that this was the best potato salad I’ve ever tried. The potatoes were extremely soft (almost mush but not quite) and in a creamy gravy of what I seem to recall being Greek yoghurt, olive oil, thyme, and garlic? Whatever it was, it was amazing. For our starters, we ordered the Avli salad (lettuce, arugula, apple, pear, avocado, pine nuts, and roquefort vinaigrette), a creamy concoction of fresh veggies and fruit, and a plate of wild mushrooms, again in a creamy sauce (apparently, we’re really into creamy stuff). For the entree we had Fouriariko, which was free range kid goat cooked in honey and thyme. All you had to do was look at the meat, and it fell off the bone. It was truly fantastic. I’m usually hesitant when it comes to goat, but this was stunningly done. Happily fed, we made our way to Chania, where the roads in the town were even more frustrating to navigate than those in Rethymnon. After about an hour of driving around in sheer confusion, we finally parked wherever we could and walked to the hotel, so they could advise where best to park. Advice: if you’re driving around Rethymnon or Chania, do not make the mistake of thinking the map you’re holding is accurate. It may be somewhat accurate, but only for those on foot. What it doesn’t tell you is that many of the roads/town areas are completely pedestrianized. Our hotel was in the middle of the pedestrianized area, but we didn’t know that and man did we try in vain to try to park near to it. Difficulty to reach aside, this was my favorite hotel from the trip. In the middle of the Old Town, the small boutique hotel is in a fabulous 600 year old mansion (must have been lovely to have lived in) with an airy rooftop and terrace that has nice views of the Venetian harbour. Our room was actually more like an apartment, with a kitchenette and bedroom on a loft level. I loved it! The walls did seem a bit thin, though, as I was woken late one night by the neighbors returning, and you could hear them all too clearly. It was also across the street from a fantastic Turkish-inspired restaurant, Tamam. 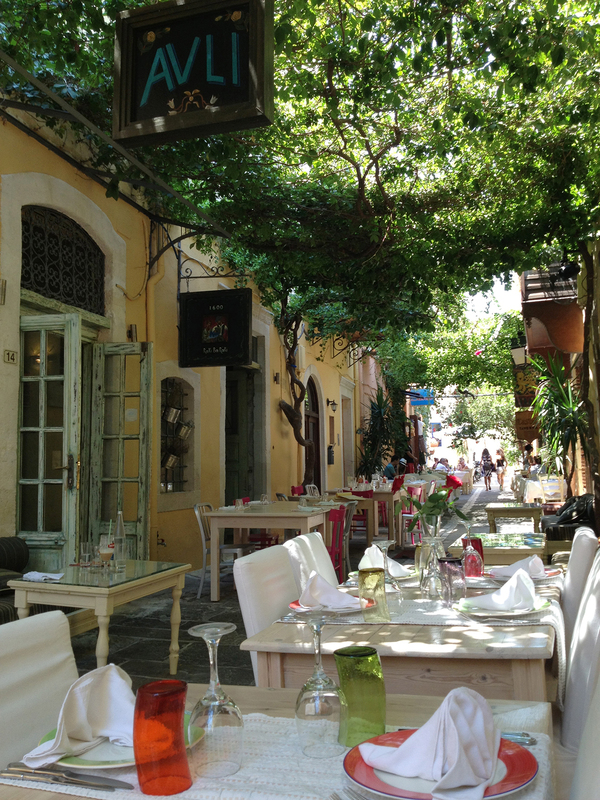 The food here was excellent, but so was everything that we ate in Chania. This place really knew good food. I haven’t a bad thing to say about it at all. Chania was great in so many respects: an endless parade of delicious restaurants (particularly on the side streets off the harbour, where it seemed more touristic), simple cafes, chic bars perfect for sundowners set alongside beautiful sailboats and yachts, lots of little boutique shops, and easy access to hiking and beach areas outside of town. Earlier that day, I was worried that I may not like Chania as much as Rethymnon. 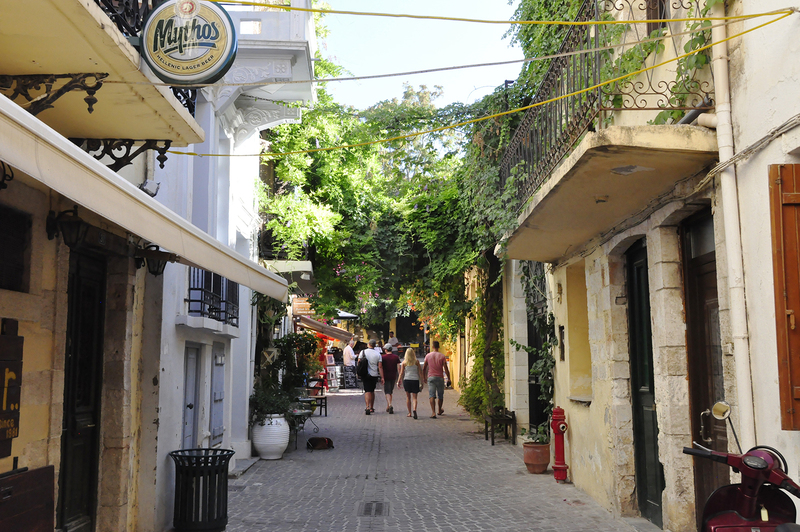 Those fears were quickly laid to rest as I explored Old Town’s narrow lanes and picturesque rows of shops and houses. 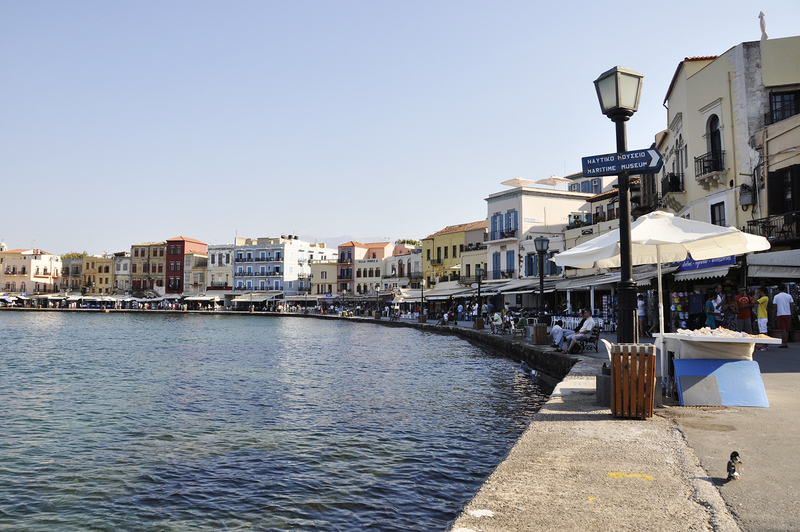 I can’t recommend Chania highly enough; it’s definitely the sort of place I wouldn’t mind living. A large part of the reason for staying in Western Crete was so that we could more easily access gorge hikes and some beaches. Samaria Gorge is the most famous and popular hike in the area, but we decided to opt out due to the large crowd it attracts in high season (thousands each day). Apparently it is popular for good reason, but I’ll just have to return and find out for myself another time. 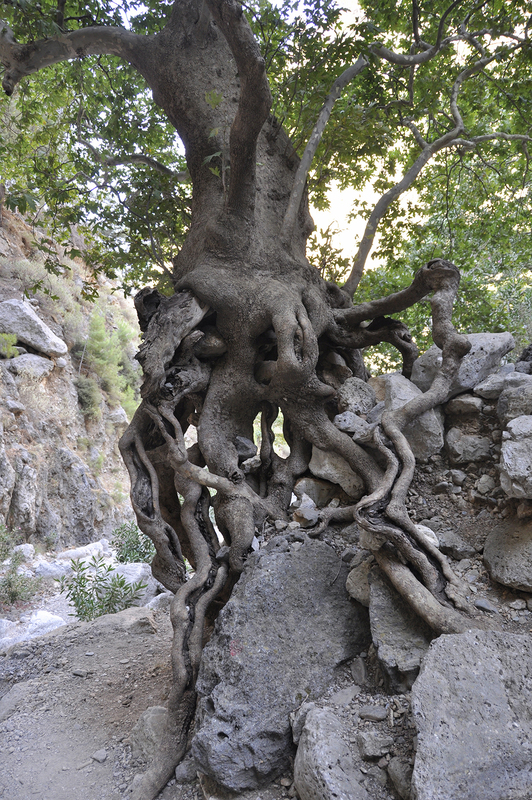 Instead, not too far away from Samaria, we opted for the Agia Irini Gorge walk. It was still beautiful, and we only saw about a dozen people the whole time were there. 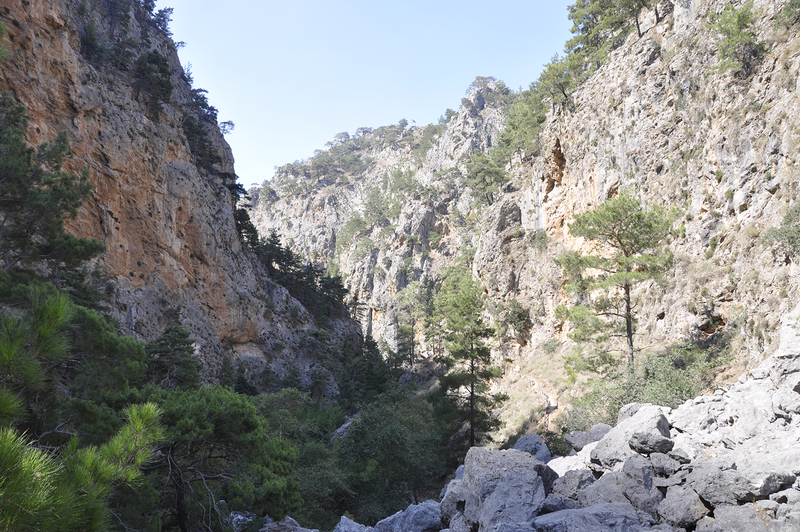 Agia Irini Gorge: not a straightforward walk down a flat, rock-less path. I don’t think I’ve ever walked a gorge before (although it’s not terribly unlike a wadi at times) and I don’t know what I was expecting, but I was not entirely prepared for the steps up and down and all of the rocks. Rocks that weren’t quite boulders, but they weren’t pebbles either. They were too large to be insignificant, but too small to be something you either avoid or climb over. I thought you’d just like, walk down the middle of the gorge, not clamber up and down the sides of it. Anyway. I still enjoyed it. Even with the never-ending soundtrack of the screaming cicadas. In Pennsylvania, I’m quite used to hearing cicadas and locusts, but the cicadas of Crete were unlike anything I’ve experienced. As soon as you leave any city/town area and get near trees, the noise is almost overwhelming, and you really do need to work to speak over them. After the walk, we were in need of some beach time, so headed to nearby Sougia. Sougia is a very small, very quiet beach on the Libyan Sea with a few little hotels and cafes/bars beachside. While it was certainly one of the quietest beaches we visited throughout the islands, I did not much care for it. It was a black pebble beach, which in theory sounds lovely (and does look nice), but man does it do a number to your feet. The midday stones are hot, the stone size, again, is not small enough to be insignificant (I’d say they were palm-sized?) and while they’re smooth, they’re still a bit difficult and painful to walk on bare-footed. The water looked beautiful; I couldn’t wait to get in. It was freezing! I was not expecting the water to be so cold, but, well…it was. And that’s about all there is to that story. The water was colder than I expected everywhere throughout this trip, but I did kind of eventually get used to it. 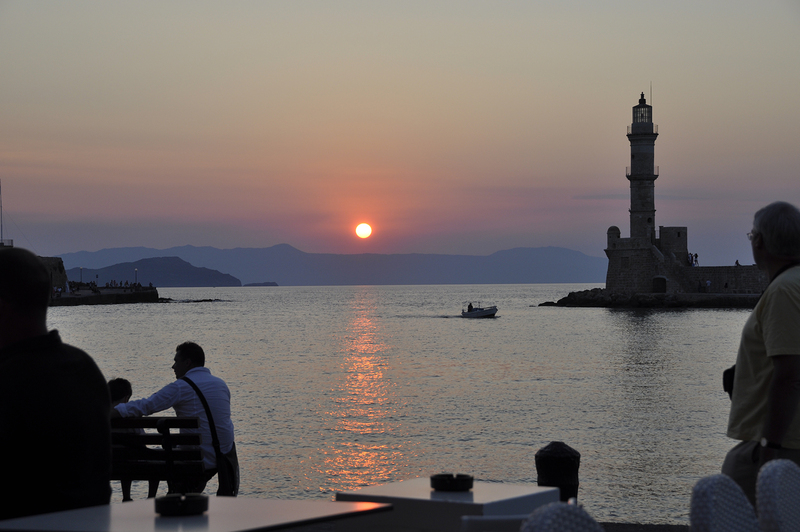 Chania sunset from a bar in the Venetian harbour. A nightly ritual I could get used to. After a final evening and night in Chania, we had to make it back to Heraklion very early in the morning to catch a ferry to our next island – Santorini. Best holiday ever…or was it?